He showed the kids a thing or two at Royal St George’s. DARREN CLARKE GAVE Northern Ireland another major championship Sunday. The 42-year-old came into the week as an afterthought, but three straight scores in the 60s and a par 70 in the final round lifted him to a comfortable three-stroke victory over Americans Dustin Johnson and Phil Mickelson. Mickelson made an impressive charge on the front side, actually moving into a share of the lead with an eagle at No. 7. But Clarke came along and put up an eagle of his own at the same hole, then watched Mickelson fade down the stretch for a 68. Clarke won with a 5-under 275, following the path of younger countrymen Rory McIlroy and Graeme McDowell as a major champion. They won the last two US Opens. No one could’ve seen this coming. It had been a decade since Clarke was a serious contender in a Grand Slam event, and the one-time face of Northern Ireland golf was thought to be long past his prime. Well, he showed the kids a thing or two at Royal St George’s. Johnson was within two strokes of the lead when he made a huge blunder, knocking an iron shot out of bounds from the 14th fairway. He wound taking a double-bogey that ended his chances, another disappointment playing in the final group of a major. Johnson settled for a 72, leaving him tied with Mickelson at 278. Last year, Johnson threw away a lead at the US Open with a closing 82, and he will forever be remembered for taking a two-stroke penalty of the 72nd hole of the PGA Championship to miss out on a play off. Email “Darren Clarke wins his first major at the British Open”. 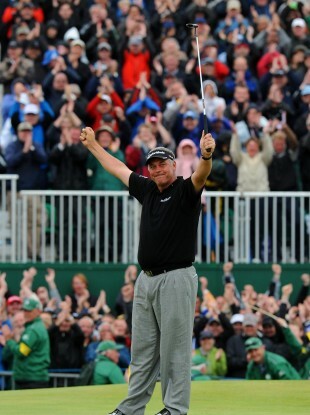 Feedback on “Darren Clarke wins his first major at the British Open”.